Shy pink flamingos, gentle sad-eyed donkeys and elusive sea turtles all share something quite rare in today's world. 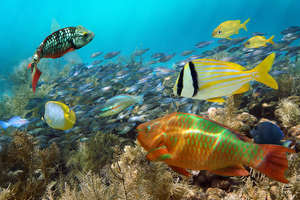 They flourish on or around Bonaire, one of the ABC isles (Aruba, Bonaire and Curacao) deep in the Southern Caribbean. Each lives in sanctuaries set up by island residents who boast an awareness and level of conservation that few countries can match. Though ecotourism is one of the latest buzzwords in the travel world, Bonaire, just 50 miles off the coast of Venezuela, was a world leader in the field of ecology long before the term was even coined. The island's greatest claim to fame is proudly touted on its license plates -- "Divers Paradise." This is no tourist-bureau puffery, although many believe that the license plates should read "Nature Lovers Paradise." Beyond the diving and snorkeling, there's windsurfing, kayaking, bird watching, kite boarding, fishing, mountain biking and horseback riding. Many Caribbean islands brag about their underwater worlds, but Bonaire has set the standard by which everywhere else in the world is measured -- it led the way by protecting sea turtles back in 1961, banning spear-fishing in 1971, making it illegal to remove live coral in 1975 and establishing the first marine park in 1979. It also helps that the island is outside the traditional hurricane zone and is a desert island with no river runoff into the sea. It has been called "Arizona by the Sea" for its climate and abundance of cacti. There is no rainy season and temperatures are consistently pleasant with lows in the 70s and highs in the 80s. Unlike its better-known neighbors, Aruba and Curacao, this isle of about 20,000 residents is quiet and laid-back. 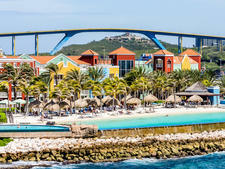 There are no flashy Las Vegas-type casinos as in Aruba or a showy pastel-colored capital city as in Curacao. The first recorded Bonaire scuba diving began back in 1962 when Don Stewart, a would-be California actor, dropped anchor on this small, arid boomerang of an island. Considered the father of Bonaire diving, he was the first to use fixed moorings to prevent coral damage and helped set up the Caribbean's first island-wide underwater park. He has received numerous international awards for his conservation efforts. The park is a United Nations Environmental Program Model Marine Protected Area. You'll be docked in downtown Kralendijk, the capital of Bonaire, off Kaya C.E.B. Hellmund. Shopping, dining, bar hopping and even snorkeling and diving are within walking distance of the dock. You will pass through Harborside Mall, a small open-air shopping center, to get from the pier to the street. There are public restrooms here, but they cost $1 to use. Just outside of the center, you can find taxi and tour operator stands for independent exploration. 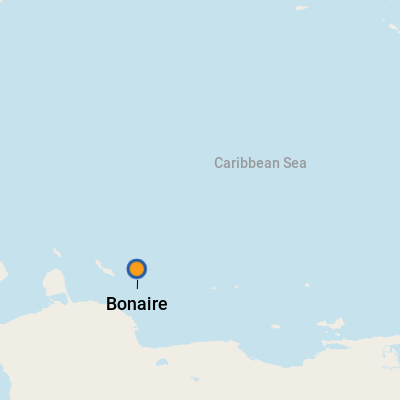 Bonaire, like Curacao, is known for being a bit windy. Don't expect gale-force winds, but there are ample breezes for excellent windsurfing. On Foot: Across from the pier is Wilhelmina Plaza. On cruise days it becomes the Bonaire Arts and Crafts Cruise Market with local artisans offering native foods, handmade wares, original art and clothing for sale. Cultural dance shows, concerts and other entertainment are held here during the day. It is an easy walk of just a few minutes to shops and restaurants along the Waterfront Promenade and Kaya Grandi, the main shopping street, one block inland. By Taxi: Taxis are readily available. 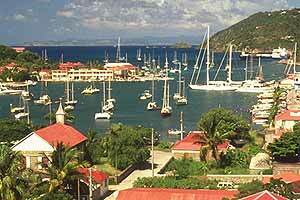 Rates are set to various destinations, and you can tour the entire island for $40 per person. Local beaches, the Plaza Resort and Harbourside Village are $20 round trip for up to four people. Popular Sorobon Beach (by Lac Bay) is $40 round trip for up to four people. By Rental Car: There are a number of car rental companies in Bonaire, but roads are narrow and what used to be one-ways are now two. If you plan on leisurely driving, let other vehicles go around you and stay alert for passing cars and motorbikes. Roads are generally well paved and well-marked, but if you will be driving into Washington Slagbaai National Park, you will need a truck or a Jeep since conditions are rough on unpaved roads. Daily rentals are harder to come by, and more expensive, so arrange yours in advance. Motor scooters and motorcycles are also available for rent as well as bicycles. The U.S. dollar is the island's official currency. ATMs are available at local banks downtown, the supermarket, Harborside Mall and several resorts. The official language of Bonaire is Dutch, but Papiamento, the local dialect of the ABC islands, is widely spoken. "Masha danki" means thank you very much in the language. English is spoken by most locals. Look for lionfish blackboard specials when in Bonaire -- they are an invasive (and tasty) species to the island. For something truly regional, sip on some cactus, whether it's in a soup or a cocktail. Tekibon is the national drink of Bonaire -- liquor similar to tequila -- extracted from the yatu cactus. There are a number of popular restaurants along the Waterfront Promenade within a couple of blocks of the ship pier, including Karel's Beach Bar and It Rains Fishes. Food trucks: For a truly special lunch with a view, venture a few minutes south of downtown to Kite City or Cactus Blue. These are two of Bonaire's venerated food trucks, and sitting along the oceanfront, toes in the sand, it will be hard to have a bad meal at either. Shopping won't take long because there aren't many shops in Kralendijk, but there are handmade ornaments, paintings and artwork from local artists at the arts and crafts market in Wilhelmina Plaza. The Bonaire Gift Shop (Kaya Grandi 13) has a little bit of everything and the salt shop -- where you can find salt for your dinner or your bath -- is next door. For unique jewelry, try Elements Bonaire (Kaya Grandi 26) or Littman's (Kaya Grandi 33-35). Littman's also has the best collection of resort wear, T-shirts, fine watches and custom-designed gold and silver jewelry. All are downtown at Harborside Mall and along Kaya Grandi, the main street. Captain Don's book "Adventures of Captain Don: Tales of Bonaire Diving (Guaranteed 85% True)" makes a fun keepsake, as would "Island Adrift," a DVD about the exploits of Captain Don. Captain Don died in 2014, but his legacy lives on around the island. The book and movie are available at Captain Don's Habitat, north of town.